Mike Surgen of St. Petersburg shows off his catch July 24 — his first time saltwater fishing in Florida. 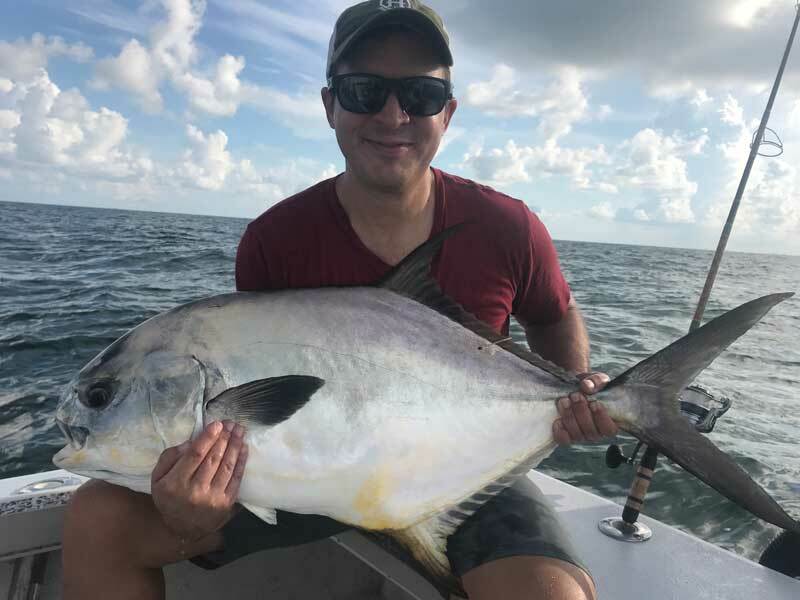 The permit was caught offshore while on a two-boat corporate retreat guided by Capt. Jason Stock. Andy Scott of Ashville, North Carolina, holds his snook for a quick trophy photo July 29 before it was released. It was caught at a nearshore reef using live shiners. Capt. Aaron Lowman said Scott and crew boated “a ton of Spanish mackerel and mangrove snapper” in addition to hooking up with several big snook. Fishing around Anna Maria Island offers a chance to hook up with a variety of species and also a variety of weather. 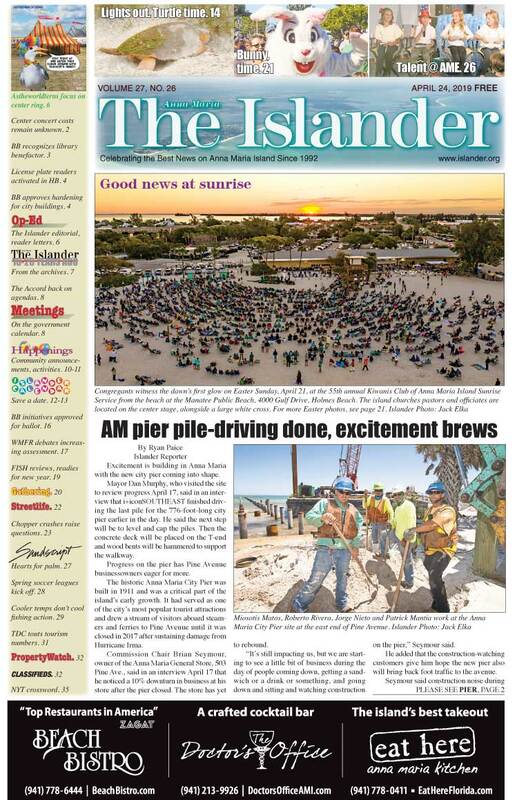 If you’ve been out in a boat or fished from the shores of Anna Maria Island recently, you know what I’m talking about. I’ve seen everything from calm, clear water to rough cloudy water, monsoon-like rainstorms to sunny skies — in the course of a single day. It’s like packing a week’s worth of weather into a four-hour fishing excursion. As the saying goes on AMI, if you don’t like the weather, wait 10 minutes. It will change. Despite the weather changes, the fishing has been pretty darn good. Inshore fishing is definitely good for a variety of species, including spotted seatrout, Spanish mackerel, catch-and-release snook and especially mangrove snapper. With the arrival of hatch bait or small shiners, the snapper have moved into the bays and Intracoastal Waterway. But any rock pile, dock, bridge piling or pier will be holding these delectable fish — they’re even all over the flats. And they love their hatch bait. Scale down your leader size and hook size to target these guys and you’re in business. Also, remember that the minimum size is 10 inches and you can keep five per person. On my charters with Southernaire, I’m targeting snapper. These fish put up a good fight on light tackle and they are among the best when breaded and fried. They make a killer ceviche, too. And, with their abundance in our waters, it’s kind of a win-win. Good action, good eating. This week I’m seeing limits of these tasty fish being reeled up, with most 12-14 inches. Mixed in with the snapper bite are flounder and juvenile grouper — more tasty table fare. Moving onto the flats, spotted seatrout are the most abundant. Free-lined shiners cast over flats 3-5 feet in depth are being devoured by hungry seatrout. Ladyfish and Spanish mackerel are present, which adds some variety to the bite. 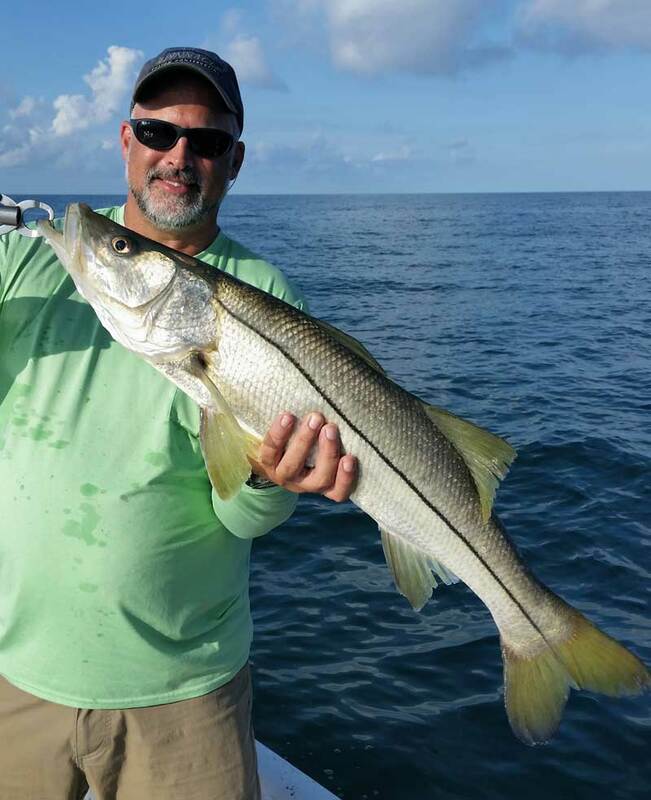 Lastly, catch-and-release snook fishing is still going strong around the passes. Snook sessions exceeding 20 fish per hour are common. And, even better, I’m seeing a few redfish mixed in with the bite. Capt. Aaron Lowman is targeting spotted seatrout throughout the grass flats of Tampa Bay. Clean, moving water is producing good rallies of these popular flats inhabitants. 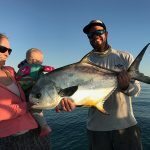 In depths of 3-7 feet, Lowman is finding numerous trout, as well as Spanish mackerel, mangrove snapper, jack crevalle and juvenile sharks. Using small free-lined shiners is key to being successful at this bite. 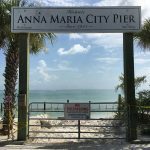 When the winds calm down and the Gulf is smooth again, Lowman anticipates good action on the artificial reefs and along the beaches. Martha Alvarado at the Rod & Reel Pier is seeing a variety of fish being reeled up. Mangrove snapper are the highlight of the catches at the pier. Most snapper are being caught by the use of live shrimp as bait. Size ranges vary from 10 to 14 inches. Other catches on live shrimp include black drum and flounder. Pier fishers using artificials, such as spoons or jigs are catching numerous Spanish mackerel 15-18 inches. Fishers looking to hook into something big are being rewarded with blacktip sharks. Casting fresh-cut mullet or mackerel chunks out from the pier is resulting in sharks 7-8-feet. Capt. Rick Gross of Fishy Business Charters is in pursuit of spotted seatrout, especially around deep grass flats and channel edges. Small, live shiners are attracting a bite. Spanish mackerel and bluefish are interested in these small baits and are being caught while targeting the trout. Gross adds that when using hatch bait, you need to down scale your hook size. He likes using an Eagle Claw Aberdeen hook in a size 1 when targeting trout. When targeting snook and reds, he suggests an Eagle Claw O’Shaunnesy hook in a size 2. Another piece of advice: Use a popping cork to make casting these small baits easier. Lastly, Gross is putting clients on limits of snapper by running to the rocks and docks. A small shiner with the addition of a split shot is resulting in a bite. Capt. David White of Anna Maria Charters is working the flats of Tampa Bay for spotted seatrout. Deep grass flats with good tidal flow are holding many trout, as well as Spanish mackerel and mangrove snapper. Casting small shiners free-lined or under a cork is resulting in a hookup for his anglers. On shallower flats, White is using the same technique to target catch-and-release snook for his sport fishers. Mangrove edges are producing the most action on the linesiders.